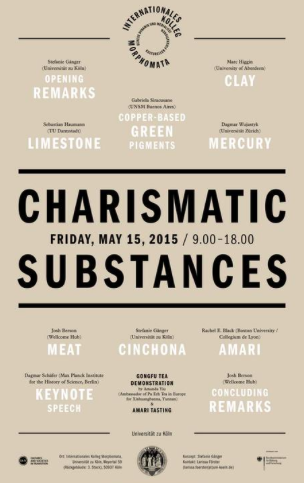 “Charismatic Substances” is a series of contributions to REMEDIA by participants from a workshop of the same name which took place at the Morphomata Center for Advanced Studies, part of the University of Cologne, in May 2015. The purpose of these pieces is to look at substances that appeal to, attract and exert influence over our physiology, behavior, creative practices and forms of sociality – by virtue both of their functional, sensorial, nutritive, chromatic, and medicinal properties, as well as their imbrication with human subjectivity. The articles will be appearing on REMEDIA over the coming weeks.